Prime Media. Addressing Media Challenges for Inkjet. Media manufacturers partner with press manufacturers to combat media compatibility challenges in the development of production inkjet printers. On-press advancements also lessen compatibility issues and broaden the application appeal. For example, earlier this year, Canon announced its ColorGrip technology, an inline paper conditioning step that allows print service providers (PSPs) to print on a wider variety of cost-effective papers, including standard uncoated and offset coated media. This article discusses on-press enhancements available to cutsheet and continuous production inkjet solutions on the market. While most water-based inkjet inks work on uncoated offset papers, better results are achieved by using paper designed specifically for inkjet. To achieve desired results, production inkjet manufacturers work to improve media compatibility challenges. According to Michael Poulin, director of marketing, production print solutions, Canon Solutions America, equipment manufacturers have taken an integrated approach to overcoming media challenges in production inkjet devices by working closely with paper manufacturers to co-develop and test various types of media designed to print specifically on production inkjet devices. “This approach has led to a rapid increase in inkjet-certified papers across the market, which means more options for PSPs and their customers,” he says. “Just like there are papers for offset, a number of paper mills have an extensive offering of inkjet-optimized papers,” comments Gianluigi Rankin, director of product marketing, Memjet. Priming technology helps to increase media compatibility while driving print costs down. Mark Schlimme, director of marketing, Screen America, agrees and says uncoated stocks are no longer a significant challenge for production inkjet or aqueous inks. However, coated stocks still remain a technical challenge. To enhance the adhesion of inkjet ink to coated paper, he suggests jetting a primer agent inline with on-press inkjet printheads. “The entire paper surface can be primed or just the areas where the image will print,” says Schlimme. However, it is important to note that the process adds cost, time, and energy, and may impact production speed or quality due to additional drying. PSPs may also use inkjet-treated papers directly from paper mills. “These papers run well but may not be as attractive as their untreated inkjet cousins,” explains Schlimme. Untreated coated stocks for offset printing are generally manufactured with brighteners and additives to enhance the paper’s appearance. This can lead to problems with ink adhesion. Schlimme believes inkjet-treated paper improves performance but carries a significant pricing premium from paper mills. Choice and availability may also not be as broad as common grade coated paper. Grant Miller, COO, Pitney Bowes Document Messaging Technologies, says inkjet manufacturers have begun using high-resolution inkjet printheads and ink to put more drops of ink per inch on paper, creating a similar visual effect to existing resolutions while using less ink. Inkjet print engine manufacturers may offer pre-treatment capabilities that help lower quality papers achiever higher quality images on less expensive paper. Treatment options include bonding agents that help ink sit better or pre-treatment via technologies like flood coaters, which treat the entire paper before printing. “Both of these allow a higher quality image and better resolution,” adds Miller. Manufacturers also focus on drying capabilities to enable a broader array of papers. “For example, drying the paper at a lower level for a longer period of time or putting enormous energy in the paper quickly to set the ink immediately addresses some of the changes manufacturers face for quality, cost, and timing,” he adds. Before choosing a media product, PSPs should consider the application. For inkjet, media products include untreated, treated, pigmented, and coated papers. Inline priming and coating technologies are offered for cutsheet and continuous inkjet devices. Bonding agents and flood coaters are offered for continuous-feed devices. Bonding agents use a printhead to spray the paper while flood coaters cover the entire page in a coating or bonding agent to improve quality and ink adherence. Treated papers have a different texture so there is limited need to use bonding agents or flood coating to establish color. Color management tools maximize the quality of the printed output while profiles may be reused in the future on the same treated paper. Color management is also key with pigmented paper as well as bonding agent considerations. “Because pigmented paper has different color profiles than white paper, all printing technologies need to adjust for the background and ensure the right visual appearance on the pigmented paper,” explains Miller. Like untreated, treated, and pigmented paper, coated paper requires color management and correction. Due to variation in the texture of the page, coated paper involves adjustments in the amount of ink used during printing. “Typically, inkjets spray smaller sized droplets on coated paper and use significantly less ink during the printing process,” continues Miller. “Many of the technologies we use in production printing have been around for 20 or more years, but they are continuously enhanced over the years to simplify the process and be as cost effective as possible,” adds Miller. He believes cutsheet paper is more difficult to handle than continuous rolls, therefore there are more limitations. Primers and coatings are generally sprayed on individual sheets or distributed by nozzles across the cutsheet instead of rollers or flooding. 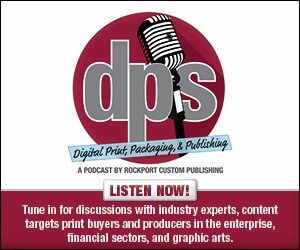 Dustin Graupman, senior VP sales and marketing, Super Web Digital, says paper mills are making big investments to enable media on all platforms. He believes that customers are more interested in buying optimized paper than making it inline in an already complex print and finishing process. “To our knowledge, most priming technologies are OEM vendor provided,” he offers. Following continued progress towards better media options for inkjet, there is always room for improvement. Providers of inks, primers, media, and printing equipment work together for continued advancements in media compatibility. To avoid a new set of challenges, Screen Americas finds the best solution for the customer is to not add equipment costs or production time and limitations. “The best solution is providing the ink and inkjet press that are tuned to print to any stock whether treated, untreated, coated, or uncoated,” recommends Schlimme. Rankin believes increasing inkjet volumes will drive media manufacturers to manufacture inkjet-optimized substrates more economically and compel more inkjet printed pages and new applications. Primers will be affected as chemical companies create more fluids and offer coatings. Graupman says the biggest improvement to come is paper mills converting dedicated lines to produce inkjet-optimized media. “The setup costs for mills are often what drives the price premiums versus standard papers. Even the equipment manufacturers promoting coated offset paper capability will often admit that the print is superior on optimized treated paper,” he adds. The industry must drive more inkjet volume to help mills justify the investment in dedicated paper lines. Paper is a large expense for any job. By adding costs like primers, coatings, mill treatments, drying time, or additional equipment to paper, end margins may quickly decrease in a competitive market. Schlimme says coated papers treated for inkjet carry 25 to 30 percent premiums. If paper costs are solved, improvements in image quality and production speeds will challenge conventional offset sheet presses. Rankin believes the best results are achieved on papers and other substrates designed specifically for inkjet inks. “Uncoated papers used today along with analog presses will likely work, but print providers should ask their press supplier to print on their most popular papers before purchasing a press. The coated papers will likely not work unless a primer is used to treat the paper,” he says. Print providers pre-qualify and run tests to address paper quality variations and to check and correct for key paper characteristics like color gamut, whiteness, and brightness. Press manufacturers and media providers are working to reduce challenges and improve inkjet compatibility. Canon’s ColorGrip technology is currently available on the Océ VarioPrint i-Series sheet-fed inkjet press. Poulin says it is essentially a conditioning fluid added to the print process to enhance image quality on commodity-grade, untreated stocks. It pretreats stock with spot application using a fifth channel in the Océ VarioPrint iSeries. “The new iQuarius inks for this press, along with ColorGrip technology, make this press more suitable for graphic arts and commercial printers who previously may not have considered production inkjet to be a viable alternative to offset and toner-based hardware,” he adds. ColorGrip represents an evolution in sheetfed inkjet technology to improve the quality and media range, enabling customers to expand their application options and grow their business. It was first developed to extend the range of offset substrates for use in inkjet applications printed on the Océ VarioPrint i-Series. “It keeps the pigments of the ink at surface level and helps the color bond to the paper so PSPs get good adhesion and color reproduction. ColorGrip essentially allows printers to use offset stocks or speciality stocks as inkjet stocks, thereby giving our customers more flexibility with their media and application options. Additionally, ColorGrip reduces front to back bleed through on thin papers as it keeps the ink pigments on top of the paper,” says Poulin. Memjet currently has several OEMs developing priming solutions for different market segments and regions. “We support them by testing printing on some of the primed media and providing feedback,” says Rankin. Memjet also has a program that tests media compatibility. Rankin says the list of compatible media is made available to OEM partners who manufacture the final printer solutions for different markets. Pitney Bowes works directly with paper mills to develop optimum paper for inkjet processes. The manufacturer also tests printers, develops color profiles, and provides paper mill partners with feedback to tune and improve paper quality. Screen Americas works directly with paper mills and customers to certify and profile standard coated and uncoated stocks. The company provides paper profiles to customers upon request. Production inkjet is flexible enough to be tailored to clients’ needs, but optimized inkjet paper may not be practical for all PSPs until inkjet volumes increase. Primers and coatings can help improve media appearance, quality, texture, and ink lay down.